Product review: new exerience – by anon, 22 Aug 15 5/5 Excellent "No difficulty arranging date, had to rearrange due to aircraft going out of service. Not difficult to find airfield. Facilities as you would expect in a small airfield. Instructor very friendly, the aircraft fairly new. The experience was not rushed. Briefing was good and all questions were answered. Taking control of a light aircraft was a new exerience for me. I would consider doing more flying and would recommend it. My wife took lots of photos. There was no rush to leave the aircraft or the facilities. " Minimum age is 12 Years (adult supervision required on airfield premises for under 16's). Please note: While we will do our best to avoid it, a fuel surcharge may be applicable at the point of booking if the price of Aviation Fuel is affected by any changes in the EU Tax Regulations or any other significant increase within the UK exceeding 10% during the validity of the voucher. Event takes place at Enstone A in Oxfordshire . The voucher will have Enstone A printed on it, but it can be used from..
ZQRG No difficulty arranging the date., but had to rearrange due to aircraft going out of service. Not difficult to find airfield. Facilities as you would expect in a small airfield. The instructor was friendly and the Aircraft fairly new. Experience was not rushed. Briefing was good and all my questions were answered. 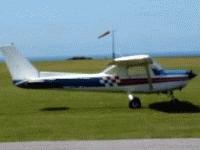 Taking control of a light aircraft was a new exerience for me. I would consider doing more flying and would definitely recommend it. My wife took photos. There was no rush to leave the aircraft or the facilities. No difficulty arranging date, had to rearrange due to aircraft going out of service. Not difficult to find airfield. Facilities as you would expect in a small airfield. Instructor very friendly, the aircraft fairly new. The experience was not rushed. Briefing was good and all questions were answered. Taking control of a light aircraft was a new exerience for me. I would consider doing more flying and would recommend it. My wife took lots of photos. There was no rush to leave the aircraft or the facilities.